I had roasted a chicken, and actually had time to boil the carcass to make some homemade chicken stock. I had a hankering for a warm bowl of chicken corn chowder, so after consulting a few recipes online, I created this soup, which was quite easy and so yummy! In a large saucepan, fry the chopped bacon and onion until bacon is cooked and onions are translucent. Drain off excess fat. 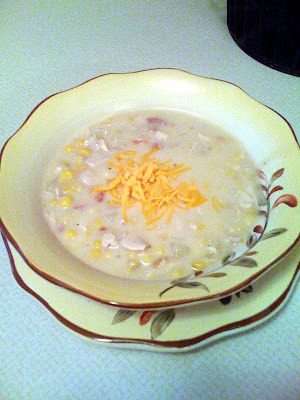 Add the cream of potato soup, chicken stock, corn, creamed corn. Stir. If soup is too thick for your taste, thin with a little milk. Add chopped cooked chicken. Season to taste with seasoning salt or cajun seasoning, as well as salt and pepper. Do not let mixutre boil, but simmer for about 20 minutes until flavours are combined. Serve with grated cheese on top if you like, some crusty bread and raw veggies or a nice grean salad. Comfort food at it's best! Peel and core apples. Slice very thinly and layer in baking dish. Sprinkle a little cinnamon and sugar over each layer. Repeat layers of apples and cinnamon/sugar until dish is almost full. Combine butter, brown sugar and flour with your fingers in a small bowl. Work until mixture is crumbly. Pack over top of the apple layers. Bake at 350 degrees until golden brown - about 40-50 minutes.